Ever hear one of those “beep, beep, beep” sounds? It comes from one of these, a digital alarm clock. 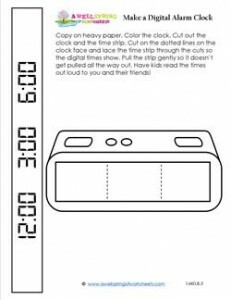 Kids color, cut out the clock, and slip the strip through so they can see the times. Please go to this page to see all of the make a clock projects in this set.